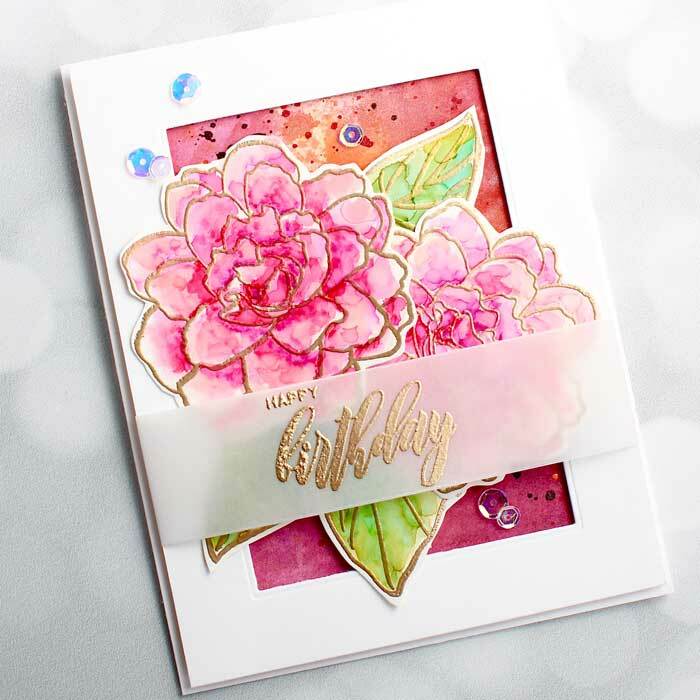 I began this card design by stamping and painting the flowers and leaves. 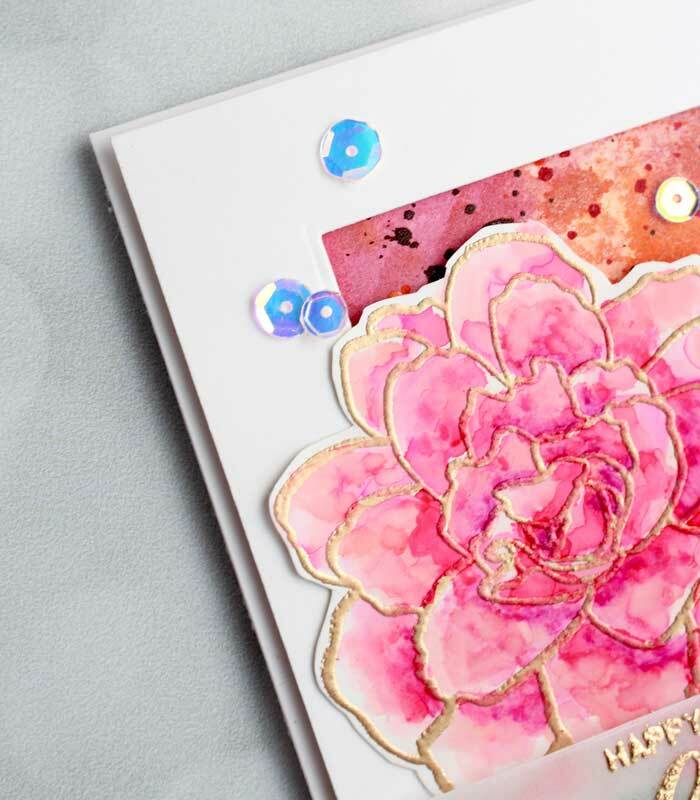 So, starting with a piece of heavy Yupo paper, I stamped them with Versamark ink and heat embossed them with Rose Gold embossing powder. 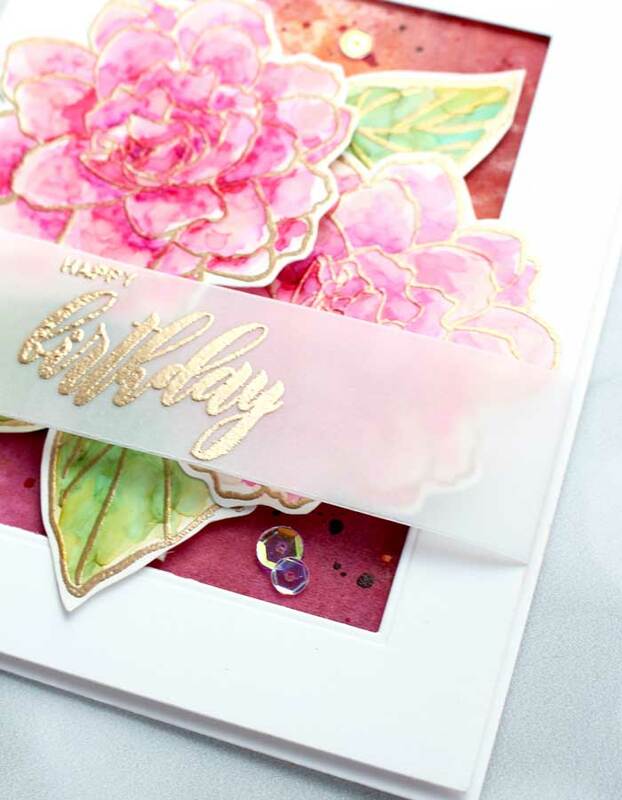 As you undoubtedly know, it is important to be careful heat embossing on Yupo since it is a plastic paper and is prone to melting. For this reason, I used the heavy version of this paper to give it a little more substance and it is not as easy to melt. Now the blossoms and leaves were ready to paint. I squeezed some Salmon alcohol ink onto my glass mat and using the Ranger alcohol ink brush, added a little alcohol blending solution to create a light wash of color that I painted onto the blossoms. Next, using a micro brush, I painted Flamingo and Shell Pink in the shaded areas with a tiny bit of Wild Plum for the deepest shading. The leaves were painted very similarly. I first used Willow for the light wash, then added Patina and Meadow with my micro brush. The alcohol inks dry in a flash so I was able to die cut them right away, then set them aside. By the way, if you want more detail on alcohol ink painting, stay tuned for next week’s video! I was trying to decide what kind of background to have as a backdrop so for inspiration I dipped into my HUGE background stash. I don’t know about you but I sometimes create a background and find it just doesn’t work for the project so off to the stash it goes. This is the case for this background. I had made it a while ago and thought it was hideous. But, not wanting to throw away good watercolor paper, I tossed it into the stash drawer. And, what do you know, it turns out to be perfect for this design – amazing! The background was made by spritzing Cosmic Berry, Puffy Heart and Orange Creme metallic sprays by Altenew onto a piece of watercolor paper. There is a heavy dose of Cosmic Berry and a spritz or two of the Puffy Heart and a strong spritz of Orange Cream (you can see in the upper right). After the sprays were dry, I splattered Cosmic Berry dots of color and let it dry again. Now on to putting it all together. Starting with a Neenah white card base, I trimmed the background to be slightly smaller, added double-sided tape and pressed it onto the card front and cut another white card panel that was a fraction smaller than the front. With this panel, I cut a rectangle out of the center of it using one of the Hero Arts Rectangle Infinity dies. After removing the center rectangle, I was left with a wide border, just what I wanted! I then added foam tape to the back and set aside for a moment while I created the sentiment. 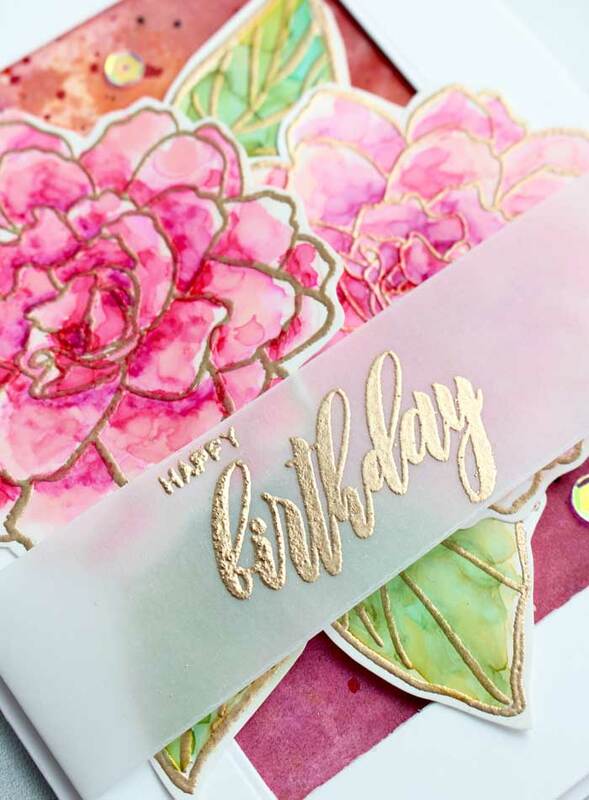 With a strip of heavy vellum, I stamped the “Happy Birthday” sentiment included in the Wispy Begonia stamp set with Versamark ink and heat embossed it with Rose Gold embossing powder. The strip was then wrapped around the white border and secured by the sticky of the foam tape. The wide border was then pressed into place. The only thing left to do was to arrange and adhere the flowers and leaves. With a bit of foam tape behind each element, I grouped the flowers and leaves and pressed them into position. Finally, I added a few clear sequins. An absolutely stunning card! Thanks so much for sharing! Thanks for your comment. Stay tuned, next week I will be demonstrating the process.